One of the best things that the ketogenic diet has going for it is that it usually eliminates all sugar cravings you have within a few weeks. This really comes in handy for kicking your sugar habit for good. But that doesn’t mean that you can’t enjoy something sweet every once and awhile. You just have to know which sweeteners are safe to use. Stevia is one of the best all natural no-calorie sweeteners available. Despite tasting sweeter than real sugar, it does not cause a spike in your blood sugar levels. You don’t need to use it a lot of it to sweeten up your favorite dishes, but it’s nice to know that stevia is there for you the next time you want to enjoy pancakes and syrup again on the keto diet. Here’s everything you need to know about stevia and why you should give it a try. Stevia is a no-calorie sweetener derived from the leaves of the Stevia plant that is native to South America. Research shows that it was first used over 200 years ago as a natural sweetener by South American people who put it in their beverages to sweeten them up or they chew it by the leaf (1). Japan was the first country to commercially adopt stevia as a sweetener in the 1970’s, and it’s still widely popular today. A high-quality stevia leaf extract should contain approximately 95 percent or more steviol glycosides. There are 11 different major steviol glycosides with two of the most abundant being rebaudioside A and stevioside. These steviol glycosides can be as much as 300 times sweeter than sucrose, but without the calories (2). Purifying stevia into a high-quality leaf extract is similar to the process that other plant-based ingredients go through, including vanilla extract and cane sugar. It’s made by harvesting the raw plant material, drying the leaves, and then steeping them in hot water. Then, the liquid extract of the leaf is purified and filtered with water and sometimes food-grade alcohol. If alcohol is used during the purifying process, then this is removed and no alcohol ends up in the final product. Sometimes other processes are used, but this is the primary way stevia is made and purified. In the end, the purified steviol glycosides are the same as the ones that were found in the leaf to begin with, meaning that a high-quality stevia leaf extract must contain 95 percent glycosides. This amount is required to meet the European and United States standards (3). Because it’s derived naturally from a plant, contains no calories, and does not impact blood sugar levels, stevia is one of the best ways to sweeten food on the ketogenic diet and you should have it on your keto shopping list. Not only does stevia NOT affect your blood sugar levels the same way real sugar does, but research shows that it may also be able to lower your levels, especially after meals. One study found that patients with type II diabetes who were given stevia extract reduced their post-meal blood sugar levels by 18 percent. Researchers believed this was thanks to one of the stevia extracts known as stevioside (4). Steve’s blood-sugar lowering properties are even more impressive when you compare them to other no-calorie sweeteners, such as aspartame. One study found that compared to aspartame, stevia lowers postprandial insulin levels better (5). Results show that people who ate stevia reported feeling more satisfied despite eating fewer calories. They also did not eat more food throughout the day to make up for this calorie deficient, which can result in better blood sugar levels and more weight loss. One of the ways stevia is able to lower blood sugar levels is because it slows down a process called gluconeogenesis, or the synthesis of glucose from noncarbohydrate sources in the liver (6). 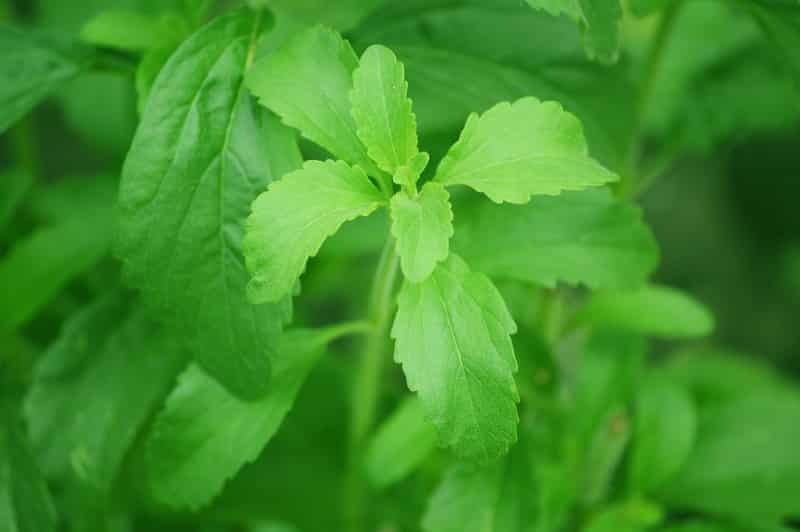 According to one study, stevioside (the stevia plant extract we mentioned in the previous section) decreased both systolic and diastolic blood pressure in people with hypertension when taken at a dosage of 250 mg three times a day for one year (7). 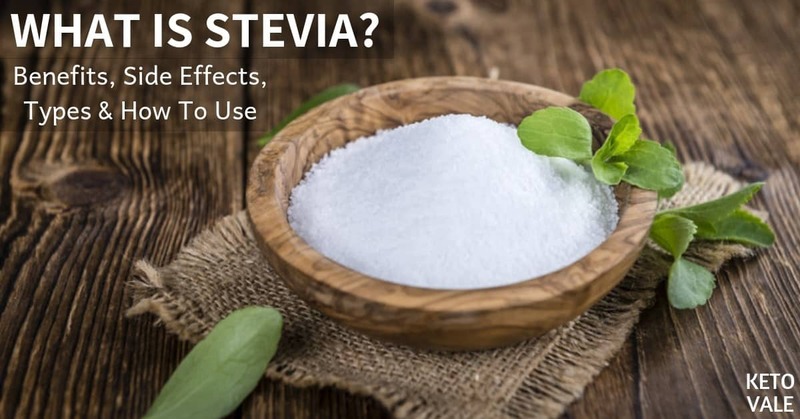 Another study found that 750- 1,500 mg of stevioside taken daily also decreased blood pressure, which shows that long term use of stevia is not only safe but can help control blood pressure. Additionally, the stevia was reported to be safe with few, if any, side effects. The group who took the stevia also reported having a better quality of life (8, 9). Because stevia has been shown to reduce blood pressure, triglyceride levels, and oxidized LDL “bad” cholesterol levels, it can be used to help treat or reduce the risk of metabolic syndrome (10, 11). According to one study, stevioside may reduce the risk of breast cancer by inducing pathways that prevent the growth of cancer cells (12). Because it’s a no-calorie sweetener, and because you’re using it on the ketogenic diet (one of the best in the world for weight loss), stevia can help you reach your weight loss goals if diet has always been a challenge for you. There are no major side effects or contraindications in regards to using stevia. This means it’s generally safe for just about anyone to take. Some people may experience gastrointestinal upset if they take too much of it, so we recommend sticking to smaller amounts at first and then gradually increasing the amount you take to make sure it works well for you. Do we have you sold on the benefits of stevia yet? Before you go running out to the supermarket to pick some up, there are several types of stevia sweeteners on the market that you’ll want to be aware of. We’ll list them below. 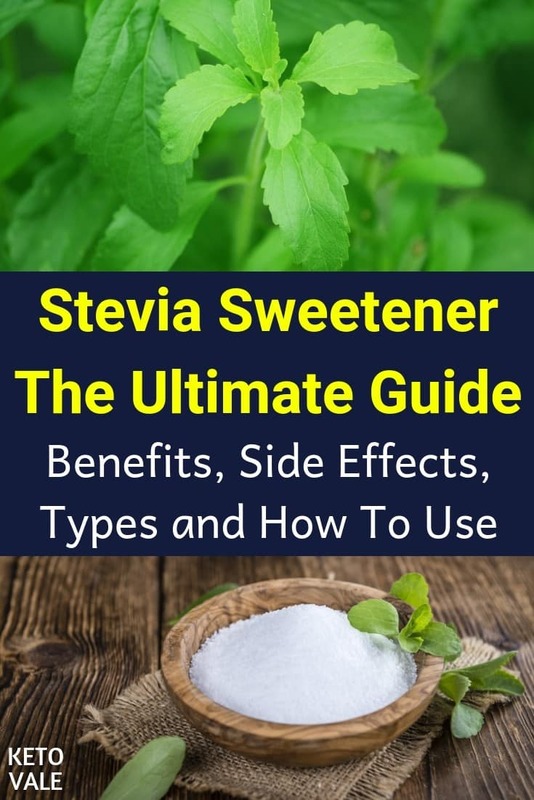 Most of the stevia you’ll find in the United States comes in powdered form, but be careful because there are different grades you should know about. If you buy the pure leaf kind, then your powdered green leaf stevia is only about 15 to 20 times sweetener than real sugar (13). It’s made by drying the leaves and grounding them into powdered form. Many powdered stevia products are highly processed, so you’ll want to be sure you’re getting one that contains only pure leaf stevia extract and no added ingredients, such as corn sugar, inulin fiber, molasses or even cane sugar. These ingredients are often added to extend the product’s shelf life, so be sure to avoid them when possible. You might have to pay more for the real stuff, but it will be worth it to ensure you’re buying a high-quality stevia that has been minimally processed. Liquid stevia is a nice option for many people because it can be mixed into drinks and other recipes easier. But again, be careful when picking out a brand because some liquid extracts are highly processed. This means that the benefit plant extracts have been heated to high temperatures and won’t give you the same health benefits as a higher-quality product would. You’ll also want to make sure your liquid extract isn’t mixed with preservatives, added sugars, or other chemicals. Concentrated stevia is the sweetest. As we mentioned before, it can be up to 300 times as sweet as regular sugar. For this reason, you’ll only need a small amount when you use it in your recipes. Look for a brand that contains no filler or other ingredients that dilute the concentrated levels of the plant to make sure you’re getting a more potent product. Sometimes, stevia is mixed with other no-calorie sweeteners to flavor your foods. Be sure that the sweeteners your stevia is mixed with are from natural sources. Monk fruit and erythritol are two of the best no-calorie sweeteners (along with stevia) for the ketogenic diet. Avoid artificial sweeteners such as sucralose or aspartame, which have an inflammatory effect on the body. Both monk fruit and stevia are great options for your ketogenic diet. Just like stevia, monk fruit is derived from a plant-based source, contains no calories, and won’t spike your blood sugar levels. Monk fruit is not as sweet as stevia. Research shows that it’s only about 150-200 times sweeter than real sugar, which is still enough to do the trick. Monk fruit gets its sweetness from an antioxidant called mogroside, which has been shown to reduce oxidative damage that may lead to diseases (14, 15). You can alternate between monk fruit and stevia or use monk fruit when you don’t need as much sweetness in your dish. Some people prefer using monk fruit over stevia because they don’t like the bitter aftertaste of stevia. Erythritol is a natural, no-calorie sweetener that is derived from foods such as fruits and fermented foods. It is referred to as a sugar alcohol and is about 60 to 80 percent as sweet as real sugar (16). Research shows that erythritol can act as an antioxidant in the body to prevent the risk of several diseases (17). You can use erythritol along with monk fruit and stevia to support your ketogenic goals. Related: Is Erythritol a Healthy Sugar Substitute? Is Stevia A Good Sugar Alternative on Keto Diet? Yes! Stevia is a great sugar alternative on the ketogenic diet. As you probably already know, sugar is not allowed on the keto diet. This is because it spikes your blood sugar levels, causes you to burn glucose (and not fat) as fuel, and leads to weight gain. Research shows that excess sugar and glucose is stored in your body as fat. But ketones aren’t. This is why you want to adopt a diet that allows you to stay in ketosis. Getting rid of sugar can be hard. But with no-calorie sweeteners like stevia around to help, it doesn’t have to be that difficult. Stevia comes in both powdered and liquid form so you can easily add it to your favorite recipes in place of sugar. It contains no calories, does not spike blood sugar levels, and even comes with a few health benefits of its own. When compared to real sugar, stevia won’t make you pack on the pounds or kick you out of ketosis. You can use stevia as you normally would when adding sugar to your favorite recipes. Keep in mind that because it’s so sweet, you’ll need to use a lot less. Add powdered or liquid stevia into your iced tea, baked keto dishes, or use it to flavor a ketogenic dessert. You can even get creative and make your own pancake or waffle maple syrup using stevia as a no-calorie way to enjoy a new twist on an old classic. You can also use stevia mixed in with other no-calorie sweeteners such as monk fruit or erythritol. You may have to play around with the sweetness of each and determine the best formula to suit your taste buds. Mixing stevia with other sweeteners is a good way to replicate the sweetness of real sugar in some of your favorite dishes. Stevia is an all natural, no-calorie sweetener that can be used to help you achieve your ketogenic goals. When you replace sugar with stevia, you’ll be dropping calories and preventing insulin related conditions from forming, such as type 2 diabetes. Because it’s up to 300 times sweeter than real sugar, you won’t need to use a lot in your recipes. We recommend looking for a brand of stevia that comes from 100 percent whole leaf stevia and is as minimally processed as possible. This is because the heating process can kill off many of the chemicals inside the stevia plant that are responsible for its health benefits. For this reason, it might cost you more money to buy a high-quality product, but the stevia will be better for you. Enjoy this post? Save it for later use! What Are The Best Low Carb Crackers You Can Eat on Keto? What Are The Best Low-Carb Substitutes for Potatoes on A Keto Diet? Should You Use Xylitol As A Sugar Substitute? How To Order Low Carb at Carl’s Jr.